Montegrappa Pen Company, a historic Italian Company based in Bassano del Grappa in Northern Italy, is known for its fine writing instruments. First started in 1912, Montegrappa has been making pens for over 100 years and continues to produce fantastic, unique and interesting designs. Being first and foremost a pen manufacturer, Montegrappa has not released many inks but has some basic colors, bold and unique in their own way. Montegrappa produces only 8 ink colors: black, brown, green, dark blue, red, violet, turquoise, and fuchsia. Most of their ink colors are basic and included in the most simple ink color palettes. Fuchsia, however, is not a basic color typically included in such a small color selection. For this reason, the ink color must be fantastic, which it is. Montegrappa Fuchsia ink is a medium to high saturation ink that is bold in color. The dark purple-pink color pops on paper and is vibrant and dark. Montegrappa Fuchsia ink is a great ink color for notes, cards, letters, or other projects that require a unique unforgettable color. Continuing reading for a chance to win the bottle of Montegrappa Fuchsia Ink we used for this review. We found the following traits during our review of Montegrappa Fuchsia ink that you may find helpful when choosing your next ink color. For our review we used a glass dip pen on French made Rhodia dot pad paper. Your results may vary depending on the paper and pen used with your writing. Montegrappa ink comes in a unique and very functional 50 ml. glass ink bottle. The design is a heavy weighted octagonal bottle with a large mouth. The cap is an easy to grip dual ribbed design for easy opening, even if the ink has dried making it harder to open. Each bottle comes in a basic blue Montegrappa cardboard box with simple extra labeling reflecting the color. Montegrappa Fuchsia ink is a mid-ranged priced fountain pen ink that retails for $20.00 in the United States. The Italian made ink in the ink well quality bottle makes the price quite reasonable. During our review of Montegrappa Fuchsia ink, we found a very reasonable dry time of approximately 6-7 seconds. This is quite typical for a medium to high saturation ink. Please note that different paper, nibs and writing style will produce different results. 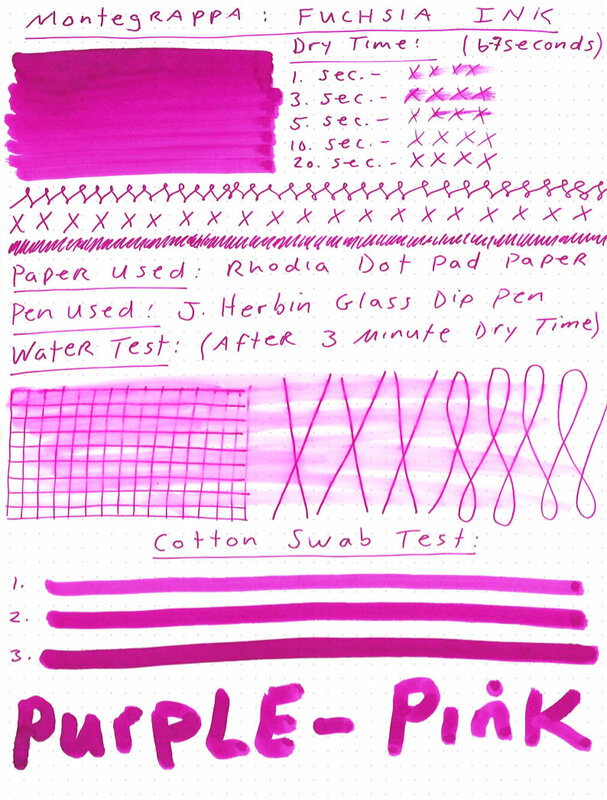 During normal use, we did not find any bleeding on Rhodia paper, however, during the cotton swab test we did have some color bleeding due to the medium to high saturation of the ink color. During normal use, we found no feathering while testing Montegrappa Fuchsia ink. All the lines were clean and distinct. Even during the water test, the lines remained fairly clear without lots of additional feathering. We conducted a water test during our review of Montegrappa Fuchsia ink where we ran a wet cotton swab over a dried ink sample. Due to the dark color, there was significant color smearing, but very little additional feathering. The lines remained legible and distinct. Montegrappa Fuchsia ink is not a waterproof ink. During our review of Montegrappa Fuchsia ink, we were able to achieve some color shading using a cotton swab but very little with the glass dip pen. This result is more than likely due to the fact that the color is bold and dark with medium to high saturation. With the right writing instrument and handwriting style, you may see some shading that we did not, based upon the cotton swab test. Montegrappa Fuchsia ink is dark purple-pink ink with medium saturation that shows up very well and legible on paper. The price is very reasonable as a mid-ranged price ink and presents more like a luxury ink with its heavy weighted ink-well quality bottle. Montegrappa Fuchsia ink has a good dry time for medium saturation ink and is bold and very vibrant in color. 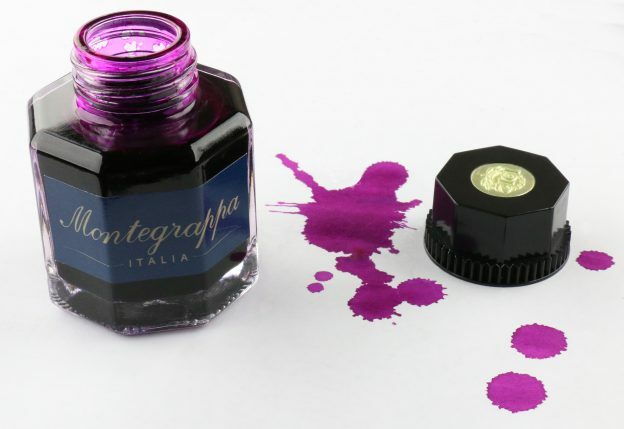 Montegrappa Fuchsia ink is a perfect ink for letters, cards, notes, and other projects. Happy writing from Italy! This entry was posted in Fountain Pen Ink and tagged fountain pen ink, Giveaway, Montegrappa on March 25, 2019 by Pen Chalet. I would love to see a review of the Lamy Crystal Azurite ink, and thanks for the giveaway! Right now I am writing a lot with a sepia ink and would like to hear about other brown-toned inks. this is so vibrant, I bet it’d be great for adding tint to other inks too. This is an absolutely gorgeous color! Any of the iroshizuku inks are my favorites just now. My current favorite ink is Edelstein Olivine but I am really liking this fuschia! One of my favorite colors. Fuchsia is my absolute favorite color! This is an incredible color that wasn’t on my radar but sure is now. I’d like to see more of their colors. I’d also really love to see some comparisons in reviews, what other colors are close to the ink being reviewed. Thanks! Sounds like this would be a great ink to use for spring letters or some journal writing. Thanks for the informative review! What an ABSOLUTELY GORGEOUS INK!! Such a beautiful colour!! I hope & pray that I’m blessed to win this ink! God Bless & the Love of Christ to you all!! Lovely color. Reminds me of my favorite Tsutsuji or Yama-budo. This looks a lot like Pilot Iroshizuku Yama-budo! I’d like to see some ink comparisons (like Diamine Aurora Borealis vs. Robert Oster Fire and Ice). This is a thorough review. I would like you to review some old standby inks such as Waterman, Sheaffer and Parker. This is so pretty! I would love to see reviews on Lamy’s new Crystal Inks! Thank you! This colour is so wonderful and absolutely gorgeous. I think this would be a perfect ink to write greeting cards and personal journals. Great ink to put a fun splash of color on my snail mail. I love learning about new ink brands. I’ve never tried Montegrappa before. The new Lamy Crustal inks sound interesting. Especially Beryl and Peridot. Thanks!